The EC Nominating Committee has selected APHA member David Lands as the APHA Executive Committee sixth member candidate for 2019–2020. The Virginia native will be considered by the APHA Board of Directors for the position; voting takes place at the 2019 APHA Convention, March 1–3 in Fort Worth, Texas. Lieutenant Colonel David Lands of Gloucester, Virginia, is a lifetime APHA member and has served on the APHA Board of Directors since 2013. He has tackled numerous leadership roles within the horse industry, including his current position as a director for the Virginia Paint Horse Club. David is deputy commander of the 192nd Operations Group, Virginia Air National Guard at Joint Base Langley-Eustis, which includes the 149th Fighter Squadron, 192nd Operations Support Squadron, 192nd Intelligence Squadron, 185th Cyber Space Operations Squadron and 200th Weather Flight. As deputy commander, David is responsible for more than 280 citizen airmen in 28 Air Force specialties. He has commanded 204 combat missions as an intelligence, surveillance and reconnaissance mission commander. His efforts in the military have earned him a variety of military awards, including a Meritorious Service Medal with three bronze oak leaf clusters, an Air Force Commendation Medal with one bronze oak leaf cluster, Meritorious Unit Award with one bronze oak leaf cluster, an Air Force Outstanding Unit Award with one silver and two bronze oak leaf clusters, and a Combat Readiness Medal with one bronze oak leaf cluster. A member of APHA since 2006, David owns and runs DreamLands Farm in Virginia with his wife, Carol. The couple specializes in breeding, selling and showing Paint Horses; they also stand LAA Heza Deluxe, a 1999 palomino tobiano stallion. 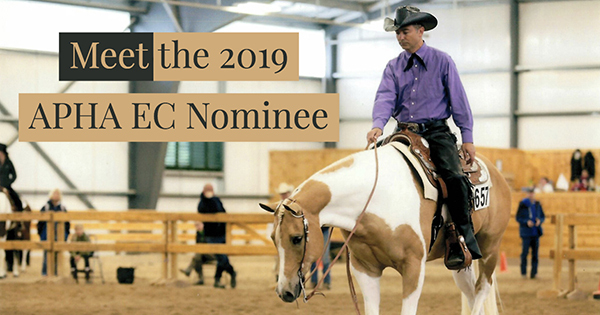 David has a strong presence in the Virginia Paint Horse community, serving as president of the Virginia Paint Horse Club from 2011 to 2016 before acquiring his current position as director. Read David’s open letter to APHA members. The APHA Board of Directors will elect the APHA Executive Committee March 3 at the APHA Convention: to learn more, visit apha.com/events/convention.